Replacing a laptop keyboard is possible if you know what you're getting into. 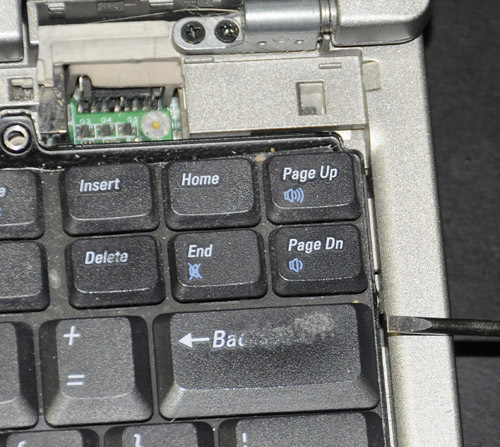 Through photos, I'll show you how I replaced my wife's laptop keyboard. I get a lot of questions about stuck or broken keys in keyboards. Occasionally, it's a software issue, but more often than not it's a physically broken key. On desktop machines that's not an issue; replacement keyboards are readily available, and easy to replace. Laptops, however, are a different matter. 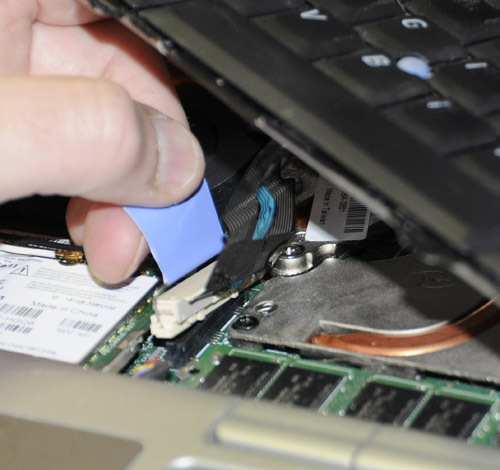 Sure enough, over the past few months my wife's laptop started having issues with the space bar and no amount of compressed air or other cleaning techniques would fix it. It was time to replace it. I brought my camera along so I could show you what it took to replace it. This is not meant as a "how to" for your laptop. Every laptop is different, and the steps I'll demonstrate below will likely be very different for different brands and models of laptops. How you open it up, how you remove and reinstall the keyboard ... heck even if you can replace the keyboard ... is going to be highly dependant on exactly what model of computer you have. 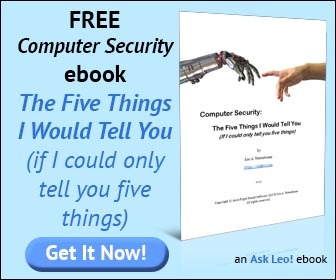 You'll need to check with your computer's manufacturer for specific instructions. That being said, I'll show you the steps I took so you can at least get a feel for what kind of a job it might be. If what you see is scary and something you'd never want to try, then you know you'll want to take it to a pro. On the other hand if what you see seems reasonable, you can take the next step of finding out more about your specific laptop. It's tempting to skip the first step. Do not skip the first step. You will be sorry if you do. Breaking your computer is bad. Breaking someone else's computer is worse. Breaking your spouse's computer is ... better left to the imagination. In over 30 years of working with computers, experience has shown that whenever I'm about to play with hardware on a computer that's even marginally important, a backup "in case something goes wrong" is critical. (And your spouse's computer is always much more than "marginally important".) After taking a backup onto an external drive even if the laptop bursts into flame while I work on it, I've got everything safely saved to restore onto a repaired or replacement machine. Take a full backup before you begin. Do not skip the first step. It's a well used Dell Latitude D610 with a fair number of "miles" on it. You can see that the keyboard shows signs of wear. There are two tabs on the actual laptop plastic case, one on each of the left and right sides, that hold the keyboard in place. They need to be carefully held aside and the keyboard can be angled up some more. Then you can slide it up a little at which point it's entirely free except for the cable. Do not stress the cable. Even on the old keyboard which you'll likely throw away, pulling or indiscriminately yanking on the cable could actually damage the circuit board that it's plugged into. Things are a little tight, so take your time, again, not stressing the computer, cable or keyboard. It's at this point, before closing things back up, that I inserted one of the batteries, booted the computer, and ensured that the new keyboard was, in fact, working. (It was - hooray!) 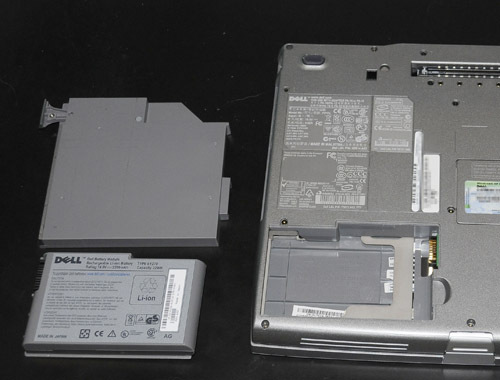 I then removed the battery (perhaps not absolutely necessary in this case), and continued. My wife's laptop now has a working keyboard once again. The Dirt - keyboards have long been known to be the dirtiest part of your computer, and you can see why. A lot of dirt, and in our case pet hair, gets trapped underneath those keys. Regularly blowing out your keyboard with compressed air helps some, but over time the results are inevitable. 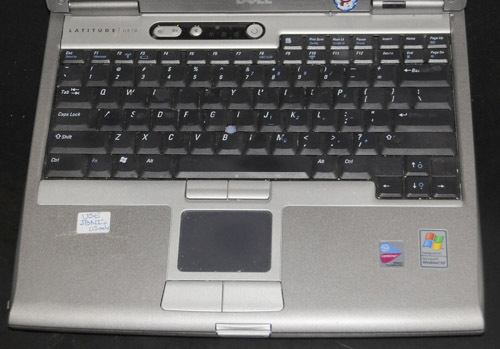 All in all, replacing this laptop's keyboard is "do-able" if you have some small amount of ability and dexterity. Other laptops, as I mentioned, may vary a great deal. 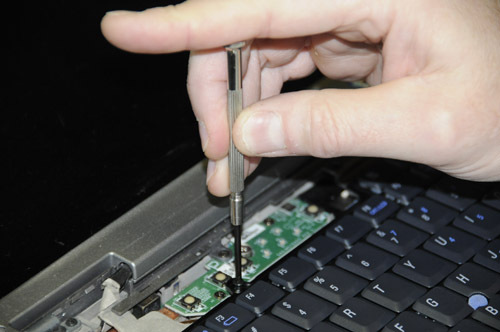 Hopefully knowing that the keyboard is likely to be the most commonly broken part of the machine, your laptop's manufacturer will have made it relatively easy to replace. 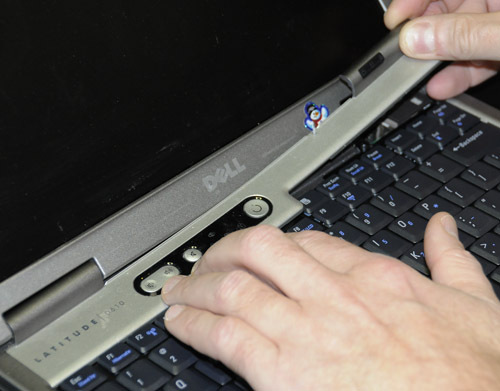 This is a great tutorial for replacing the keyboard on a Dell Latitude D610. Like Leo says though, procedures for removal/replacement of hardware components, including keyboards can be very different on different systems. --even different models in the same product line can be very different. Besides User's Guides, many manufacturers also supply Hardware Maintenance Manuals via their web sites. Try to find the hardware manual that covers your specific model. They generally have a removals/replacements section that will provide complete step-by-step instructions including graphics almost as good as Leo's photos. You lucked out doing it on a Dell. :) They're quite a bit easier than some other models I've had the misfortune of working with. This isn't a task for the faint of heart. If you're very careful, it's a pretty safe procedure usually. It's a nightmare on some laptops though. The one thing I really, really caution you on is the little ribbon cable that connects the keyboard to the motherboard. The cable and the connector on the motherboard are both very easy to break if you aren't careful. I had the misfortune of working in laptop refurb in my teenage years, and it's something I avoid as much as possible now. Laptops are painful to work with, probably more so now than they were a decade ago (though the internals haven't changed as considerably as you would think in that time). Does anyone know how to change a Sony Notebook keyboard? Sony want over �180 to do it. What does a replacement keyboard cost? I am using a separate wireless keyboard now , but it does rather defeat the object of a laptop computer. No one has mentioned so far, but getting grounded probably would not hurt. I have not actually had to do this, but have worked around some electronics. A grounded wrist strap is a fairly inexpensive item, and you can zap electronics without even knowing if if you are not completely draining any static that is around. Concerning "How to replace your laptop KEYBOARD"
I think you have done a great disservice to your readers by publishing the article even though it is technically correct, this procedure is not for the "faint of heart". The odds of ever reconstructing your laptop and having it still work is minimal at best. I would equate it to dismantling your Rolex watch, cleaning it . reassembling it (if you can) then expect it to ever work again. Remember computer manufacturers pay huge amounts of money to be able to pack in a whole bunch of of component in the least amount of space. Did you ever try to work on a Porsche, same principal. To me the only 2 viable solution to a broken keyboard is; hook up a USB (wired or wireless)keyboard or if it is not possible to carry the "extra" keyboard around and you absolutely need a portable computer, Bye a new one. PS same solution for a broken monitor. PS. I fully agree with Bradley. I've been working with computers for quite a few years. (1954) yes going on 55 years. Working on the biggest and the smallest. With no infections ever. At present I run 3 laptop's and 2 desktops. all hooked up to the net. Like you said, the secret is watch what you are downloading. Be careful, it's a dangerous world out there. Of course taking apart anything, especially computers, comes with its risks. This helps to understand one possible disassembling scenario. Thanks for sharing. I agree, using a grounded glove would be helpful. Also, I would prefer a wireless keyboard(and mouse if I used it) as I could then position the monitor of the laptop to where I don't strain my neck, while placing the keyboard in my lap. redefining the laptop needs to happen. I've had to do this job 3 times on my son's Dell (keep drinks away!!!). Find yourself some pictures on how to take your model apart w/ a "disassemble Sony ----" in Google. Don't fall prey to downloading instructions from Ebay.. anything they're selling is available to you too with enough searching. The trick is not to bust anything. Some laptops come apart harder than others, but when engineers design & put things together.. they also have to come apart. As far as people here claiming the "sky is falling".. it certainly is not. Alarming people is the real disservice. And adding a wireless keyboard indeed defeats the entire laptop concept. For God's sake.. it's not the space shuttle.. it's a laptop keyboard replacement.. !! Hey there Lou: in your message above you mentioned that Leo did a disservice to readers by describing this procedure. You mentioned one of the viable solutions is to buy a new lap top. But if you are going to buy a new lap top... then what have you got to lose by trying to fix the old one? I don't think the odds of success are as low as you think. In all my years I know 2 people who changed their laptop keyboards and both operations were successful. So I simply think the odds of success are not as bad as you implied. However I do agree with you that it is dangerous. There is a high chance of failure. So it's risky. But it's worth a shot if your only other real option is to buy a new lap top. In that case you may as well roll the dice and hope for the best! Your article sure is good. It will sure benefit my good friend who has a "thousand year-old" laptop. The pictures included will also be of good help! Dear Leo ,Please ignore the alarmists !!! THANKS FOR YOUR ARTICLE I GOT 2 BUSTED KEYS ON THIS EXACT MODEL THANK GOD THEY ARE THE FUNCTION AND ONE CONTROL KEY (THERES 2!! )AND AM PLANNING ON BUYING A REPLACEMENT KEYBOARD OFF EBAY AND WAS WONDERING HOW TO TAKE IT ALL APART. I BUSTED THE KEYS REPLACING THE RAM UNDER THE KEYBOARD AND JUST NEEDED TO KNOW HOW TO DISCONNECT THE CABLEKNOW THAT i FIGURED OUT HOW TO TAKE THE KEYBOARD OFF THE HARD WAY. THANKS AGAIN i KNOW HOW TO DO ALL THIS TYPE STUFF ON A DESKTOP BUT THIS WAS MY FIRST LAPTOP. You'll need to find out from the manufacturer. 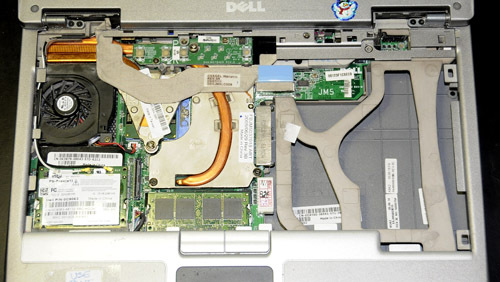 Replacing harddisk, led screen, keyboard in old laptop is easy but getting the new parts for old laptop is a question. Well this might sound pretty stupid...however, after years of running notebook keyboard with simple use, dust, wear and tear (I even had a chipmunk that used to bite the keys off and once peed on the keyboard and ruined it...). So the best solution in my opinion is to "protect" yourself. In Thailand over here they have some great silicone protectors and they work very well. If anybody is interested let me know and I can mail you some, never seen any in Canada. My laptop Dell d610 some keys are not working e.g. (b,n,/,arrow left, arrow right,arrow down and space bar) when i replace the keyboard it shows me same problem. Then i check the flex cable connector and connect it again it would be also same problem that the same keys are not working. After that i bought a external usb keyboard the open that i saw there the keys (b,n,/,arrow left, arrow right,arrow down and space bar)are connected with one wire and that is not working in the board may i know now what is the solution. Sure, if not replaced properly. Also if get the different style keyboard, will my laptop recognize this new hardware? My laptop Dell Inspiron 1545 some keys are not working e.g. (b,n,/,arrow left, arrow right,arrow down and space bar). may i know now what is the solution. I have a hp4530s laptop. my spacer couldn't work with in 2 days. i bought it 1 month before. how i solved thjs problem. i have just replaced a us internaational keyboard on my acer aspire 4820t laptop, with a uk version, but some of the keys are transposed. do i need to replace the drivers as well. if so, can you provide a link for me please. thanks in advance . steve m.
This can be fixed by a keyboard setting in the control panel. Then choose English (United Kingdom) as a default from the pulldown menu.